According to this, the shapes of the numbers was derived from a notation where for each numeral contains its own number of angles. It’s a really interesting idea, and it would be really interesting if it were true. The problem is, it isn’t. 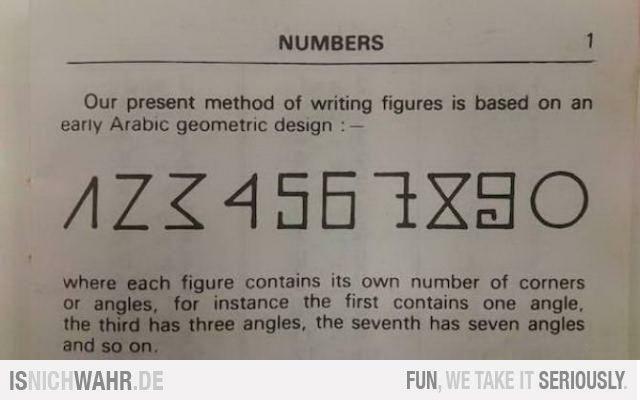 Look at the numerals in that figure. Just by looking at them, you can see quite a number of problems with them. Look at the 7. The crossed seven is a recent invention made up to compensate for the fact that in cursive roman lettering, it can be difficult to distinguish ones from sevens, the mark was added to clarify. The serifed foot on the 7 is even worse: there’s absolutely no tradition of writing a serifed foot on the 7; it’s just a font decoration. The 7’s serifed foot is no more a part of the number than serifed foot on the lowercase letter l is an basic feature of the letter ls. Worse is the curlique on the 9: the only time that curly figures like that appear in writing is in calligraphic documents, where they’re an aesthetic flourish. That curly thing has never been a part of the number 9. But if you want to claim this angle-counting nonsense, you’ve got to add angles to a 9 somewhere. It’s not enough to just add a serifed foot – that won’t get you enough angles. So you need the curlique, no matter how obviously ridiculous it is. It’s quite fascinating to study the origins of our numeric notation. It’s true that we – “we” meaning the scholarly tradition that grew out of Europe – learned the basic numeric notation from the Arabs. But they didn’t invent it – it predates them by a fair bit. The notation originally came from India, where Hindu scholars, who wrote in an alphabet derived from Sanskrit, used a sanskrit-based numeric notation called Brahmi numerals (which, in turn, were derived from an earlier notation, Karosthi numerals, which weren’t used quite like the modern numbers, so the Brahmi numerals are considered the earliest “true” arabic numeral.) That notation moved westward, and was adopted by the Persians, who spread it to the Arabs. As the arabs adopted it, they changed the shapes to work with their calligraphic notations, producing the Bakshali form. In the Brahmi numerals, the numbers 1 through 4 are written in counting-based forms: one is written as one horizontal line; 2 as two lines; 3 as three lines. Four is written as a pair of crossed lines, giving four quadrants. 5 through 9 are written using sanskrit characters: their “original” form had nothing to do with counting angles or lines. The real history of numerical notations is really interesting. It crosses through many different cultures, and the notations reform each time it migrates, keeping the same essential semantics, but making dramatic changes in the written forms of individual numerals. It’s so much more interesting – and the actual numeral forms are so much more beautiful – than you’d ever suspect from the nonsense of angle-counting. This entry was posted in Bad Numbers on July 21, 2015 by markcc. A few weeks ago, my wife took me out to dinner at an Izakaya that she found. If you don’t know about Izakayas, you really need to find one and try it. An Izakaya is basically a Japanese sake bar – it’s sort-of the Japanese equivalent of a Tapas bar – you order a variety of small dishes, and eat them with your sake. Izakayas are really terrific – they’re a nice informal place to have dinner with good sake, and a variety of delicious dishes. One of the dishes we had was Tsukune, which is a standard at Izakayas. It’s basically a meatball made from ground chicken, and served drizzled with a sauce that’s a lot like a thick, rich teriyaki. These suckers were the tenderest, most succulent meatballs I’ve ever eaten. I was strongly motivated to try to reproduce them. So I did some research. And it turned out that there were two tricks to how really good tsukune come out that way. One part is what goes in: pretty much any part of the bird that can get finely minced. Breast, thigh, neck, legs, wings. If the cartilage is soft enough to be minced, it goes right in with the meat. The other part is how it’s treated. The meat has the living hell beaten out of it. It’s finely minced, and then the ground meat is kneaded and pounded until it’s all soft and firmly stuck together. That process both binds the meat without adding any extra binding agents like eggs, and tenderizes it. I really don’t like working with cartilage. I’ve tried it in some recipes in the past, and I find it really unpleasant. It’s slimy, and it tends to sometimes form sharp edges that can cut you. Getting cut by raw meat is not something I like doing. So I decided to try to reproduce as much of the flavor as I could, using ingredients that I had on hand. And I tried couple of tricks to get the tender texture. It’s not as tender as a true Izakaya tsukune, but it was awfully good. I relied on three things to get the tenderness I wanted. Force: I beat the living hell out of the meat. I didn’t do it by kneading; instead, I took chicken thighs, cut the meat off the bones, and then beat the crap out of it with the flat of my meat tenderizer. By the time I was done, I wouldn’t describe the result as a particular thickness; I’d say that it had been reduced to more of a chicken paste smeared across my cutting board. Chemistry: I took that, and put it into a flat bottomed baking dish, and poured a cup of apple juice over it. There’s an enzyme in fruits from the apple family that tenderizes meat, so I let that do some work. Slow heat: Finally, I browned the meatball quickly in a pan, and then transferred them to a baking dish with the sauce, and put them into a low oven for a long time. The result was, honestly, not very much like the tsukune from the Izakaya. But it was really, really delicious. I mean really, seriously delicious – like some of the best meatballs I’ve ever eaten. Not quite as good as the Izakaya ones, and quite different – but so, so good. It’s not a difficult dish to make, but it is time consuming. Not really that different from other meatball recipes I’ve made: meatballs are often the kind of dish that cooks all day. The sauce cooks for a while on its own, and then cooks more with the meatballs in it. But the chicken needs to marinate for an hour or two – so you really need to start both around the same time. The sauce is basically just a slightly amped up teriyaki sauce – but homemade is so much better than the crap you get out of a bottle, and it’s really easy to make. White part of one scallion, minced. 3 cloves finely minced garlic. 1 inch section of fresh ginger, finely minced. 1/3 cup soy sauce (ideally good quality shoyu!). Heat a bit of oil in a pot. When it’s hot, add the garlic, ginger, and scallions, and cook until it’s nice and fragrant. Add the sake, and then let it reduce by half. Reduce the heat to medium-low, and add the rest of the liquids and the brown sugar. With a meat tenderizer, pound the heck out of the chicken thighs until they’re severely mangled and very thin. Put them into a dish with the apple juice, and put that into the refrigerator for an hour or two. Put the marinated thighs into the food processor with 1/4 cup of the sauce, and pulse a couple of times until they’re minced. Fold in the onion and the bread crumbs. Chill the ground meat for an hour until it firms up. Separate into about 30 meatballs – it should be around a heaped teaspoon per meatball. Roll each meatball in flour; flatten slightly, and then brown the two flat sides in a hot pan with a bit of oil. The meatballs will not be cooked through by this – you’re just browning the meatballs, not fully cooking them. Put the meatballs into a baking dish, cover with the sauce, and bake for 1 1/2 hours. Remove the meatballs from the sauce, and reduce the sauce until there’s just a cup or so left. Thicken with a bit of cornstarch. Pour the sauce back over the meatballs, and sprinkle with scallion greens. Serve this on a bed of simple steamed rice, and some stir fried veggies on the side. Home cooking doesn’t get better than this. This entry was posted in Recipes on July 19, 2015 by markcc. Over time, I’ve come to really, really hate the number φ.
φ is the so-called golden ratio. It’s the number that is a solution for the equation (a+b)/a = (a/b). 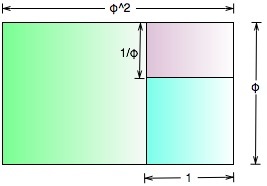 The reason that that’s interesting at all is because it’s got an interesting property when you draw it out: if you take a rectangle where the ratio of the length of the sides is 1:φ, then if you remove the largest possible square from it, you’ll get another rectangle whose sides have the ratio φ:1. If you take the largest square from that, you’ll get a rectangle whose sides have the ratio 1:φ. And so on. The numeric value of it is (1+sqrt(5))/2, or about 1.618033988749895. The problem with φ is that people are convinced that it’s some kind of incredibly profound thing, and find it all over the place. The problem is, virtually all of the places where people claim to find it are total rubbish. A number that’s just a tiny bit more that 1 1/2 is really easy to find if you go looking for it, and people go looking for it all over the place. People claim it’s in all sorts of artwork. You can certainly find a ton of things in paintings whose size ratio is about 1 1/2, and people find it and insist that it was deliberately done to make it φ. People find it in musical scales, the diatonic and pentatonic scales, and the indian scales. People claim it comes up all over the place in nature: in beehives, ant colonies, flowers, tree sizes, tree-limb positions, size of herds of animals, litters of young, body shapes, face shapes. People claim it’s key to architecture. And yet… it seems like if you actually take any of those and actually start to look at it in detail? The φ isn’t there. It’s just a number that’s kinda-sorta in the 1 1/2 range. One example of that: there’s a common claim that human faces have proportions based on &phi. You can see a bunch of that nonsense here. The thing is, the “evidence” for the claim consists of rectangles drawn around photographs of faces – and if you look closely at those rectangles, what you find is that the placement of the corners isn’t consistent. When you define, say, “the distance between the eyes”, you can measure that as distances between inner-edges, or between pupils, or between outer edges. Most of these claims use outer edges. But where’s the outer edge of an eye? It’s not actually a well-defined point. You can pick a couple of different places in a photo as “the” edge. They’re all close together, so there’s not a huge amount of variation. But if you can fudge the width a little bit, and you can fudge other facial measurements just a little bit, you’ve got enough variation that if you’re looking for two measurements with a ratio close to φ, you’ll always find one. Most of the φ nonsense is ultimately aesthetic: people claiming that the golden ratio has a fundamental beauty to it. They claim that facial features match it because it’s intrinsically beautiful, and so people whose faces have φ ratios are more beautiful, and that that led to sexual-selection which caused our faces to embody the ratio. I think that’s bunk, but it’s hard to make a mathematical argument against aesthetics. But then, you get the real crackpots. There are people who think φ has amazing scientific properties. In the words of the crank I’m writing about today, understanding φ (and the “correct” value of π derived from it) will lead humanity to “enter into a veritable Space Age”. I’m talking about a guy who calls himself “Jain 108”. I’m not quite sure what to call him. Mr. Jain? Mr. 108? Dr 108? Most of the time on his website, he just refers to himself as “Jain” (or sometimes “Jain of Oz”) so I’ll go with “Jain”). What you can read for free is more than enough to conclude that he’s a total idiot. I’m going to focus my mockery on one page: “Is Pi a Lie?”. On this page, Jain claims to be able to prove that the well-known value of π (3.14159265….) is wrong. In fact, that value is wrong, and the correct value of π is derived from φ! The correct value of π is , or about 3.144605511029693. For reasons that will be soon explained, traditional Pi is deficient because historically it has awkwardly used logical straight lines to measure illogical curvature. Thus, by using the highest level of mathematics known as Intuitive Maths, the True Value of Pi must be a bit more than anticipated to compensate for the mysterious “Area Under The Curve”. When this is done, the value, currently known as JainPi, = 3.144… can be derived, by knowing the precise Height of the Cheops Pyramid which is based on the Divine Phi Proportion (1.618…). Instead of setting our diameter at 1 unit or 1 square, something magical happens when we set the diameter at the diagonal length of a Double Square = 2.236… which is the Square Root of 5 (meaning 2.236… x 2.236… = 5). This is the critical part of the formula that derives Phi , and was used by ancient vedic seers as their starting point to construct their most important diagram or ‘Yantra’ or power-art called the Sri Yantra. With a Root 5 diameter, the translation of the Phi’s formula into a geometric construct derives the royal Maltese Cross symbol, concluding that Phi is Pi, that Phi generates Pi, and that Pi must be derived with a knowledge of the Harmonics of Phi. When this is understood and utilized, we will collectively enter into a veritable Space Age. This explanation does a beautiful job of demonstrating how utterly ignorant Jain is of math. Archimedes may have been the first person from the western tradition to have worked out a mechanism to compute a value for π – and his mechanism was a good one. But it’s far from the only one. But let’s ignore that for a moment. Jain’s supposed critique, if true, would mean that modern calculus doesn’t work. The wedge-based computation of π is a forerunner of the common methods of calculus. In reality, when we compute the value of almost any integral using calculus, our methods are based on the concept of drawing rectangles under the curve, and narrowing those rectangles until they’re infinitely small, at which point the “area under the curve” missed by the rectangles becomes zero. If the wedge computation of π is wrong because it misses are under the curve, then so will every computation using integral calculus. Gosh, think we would have noticed that by now? Let’s skip past that for a moment, and come back to the many ways that π comes into reality. π is the ratio of the diameter of a circle to its radius. Because circles are such a basic thing, there are many ways of deriving the value of π that come from its fundamental nature. Many of these have no relation to the wedge-method that Jain attributes to Archimedes. These have no relation to the wedge-method – they’re derived from the fundamental nature of π. And all of them produce the same value – and it’s got no connection at all to φ.
NASA admitted that when the original Mooncraft landing occurred, the targeted spot was missed by about 20km? Let’s take just a moment, and consider that. It’s a bit difficult to figure out how to address that, because he’s not mentioning what part of the trajectory was messed up. Was it the earth-to-moon transit of the full apollo system? Or was it the orbit-to-ground flight of the lunar lander? Since he doesn’t bother to tell us, we’ll look at both. π does matter when computing the trajectory of the earth-to-moon trip – because it involves the intersection of two approximate circles – the orbit of the earth around the sun, and the orbit of the moon around the earth. (Both of these are approximations, but they’re quite useful ones; the apollo trajectory computations did rely on a value for π.
Let’s look at earth-to-moon. I’m going to oversimplify ridiculously – but I’m just trying to give us a ballpark order-of-magnitude guess as just how much of a difference Mr. Jain’s supposed error would cause. THe distance from the earth to the moon is about 384,000 kilometers. If we assume that π is a linear factor in the computation, then a difference in the value of pi of around 1 part in 1000 would cause a difference in distance computations of around 384 kilometers. Mr. Jain is alleging that the error only caused a difference of 20 kilometers. He’s off by a factor of 15. We can hand-wave this away, and say that the error that caused the lander to land in the “wrong” place wasn’t in the earth-moon trajectory computation – but we’re still talking about the apollo unit being in the wrong place by hundreds of kilometers – and no one noticing. What if the problem was in the computation of the trajectory the lander took from the capsule to the surface of the moon? The orbit was a nearly circular one at about 110 kilometers above the lunar surface. How much of an error would the alleged π difference cause? About 0.1 kilometer – that is, about 100 meters. Less than what Jain claims by a factor of 200. The numbers don’t work. These aren’t precise calculations by any stretch, but they’re ballpark. Without Jain providing more information about the alleged error, they’re the best we can do, and they don’t make sense. Jain claims that in space work, scientists now use an adjusted value of π to cover the error. This piece I can refute by direct knowledge. My father was a physicist who worked on missiles, satellites, and space probes. (He was part of the Galileo team.) They used good old standard 3.14159 π. In fact, he explained how the value of π actually didn’t need to be that precise. In satellite work, you’re stuck with the measurement problems of reality. In even the highest precision satellite work, they didn’t use more that 4 significant digits of precision, because the manufacturing and measurement of components was only precise to that scale. Beyond that, it was always a matter of measure and adjust. Knowing that π was 3.14159265356979323 was irrelevant in practice, because anything beyond “about 3.1416” was smaller that the errors in measurement. Mr. Jain’s next claim is far worse. Also, an ex-Engineer from NASA, “Smokey” admitted (via email) that when he was making metal cylinders for this same Mooncraft, finished parts just did not fit perfectly, so an adjusted value for Pi was also implemented. At the time, he thought nothing about it, but after reading an internet article called The True Value of Pi, by Jain 108, he made contact. This is very, very simple to refute by direct experience. This morning, I got up, shaved with an electric razor (3 metal rotors), made myself iced coffee using a moka pot (three round parts, tight fitted, with circular-spiral threading). After breakfast, I packed my backpack and got in my car to drive to the train. (4 metal cylinders with 4 precisely-fitted pistons in the engine, running on four wheels with metal rims, precisely fitted to circular tires, and brakes clamping on circular disks.) I drove to the train station, and got on an electric train (around 200 electric motors on the full train, with circular turbines, driving circular wheels). All those circles. According to Jain, every one of those circles isn’t the size we think it is. And yet they all fit together perfectly. According to Jain, every one of those circular parts is larger that we think it should be. To focus on one thing, every car engine’s pistons – every one of the millions of pistons created every year by companies around the world – requires more metal to produce than we’d expect. And somehow, in all that time, no one has ever noticed. Or if they’ve noticed, every single person who ever noticed it has never mentioned it! Jain also claims that the value of e is wrong, and comes up with a cranky new formula for computing it. Of course, the problem with e is the same as the problem wiht π: in Jain’s world, it’s really based on φ. In Jain’s world, everything is based on φ. And there’s a huge, elaborate conspiracy to keep it secret. Any Jain will share the secret with you, showing you how everything you think you know is wrong. You just need to buy his books ($77 for a hard-copy, or $44 for an ebook.) Or you could pay for him to travel to you and give you a seminar. But he doesn’t list a price for that – you need to send him mail to inquire. This entry was posted in Bad Geometry, Bad Math, Numerology on July 13, 2015 by markcc. I made an amazing dinner tonight, out of a total ad-lib. So I want to write it down so I’ll remember it. This turned out to be the best steak I’ve ever made. Mix together the liquid ingredents in a baking dish. dip the steak into it, to coat both sides. Press kombu leaves into both sides of the steak, and then put it in the dish, and leave it in the fridge for a couple of hours. Take the steak out, pat dry. Toss the steak on a very hot grill, and cook for 2 minutes on one side, and about one minute on the other. Mix together the sugar and water, and cook on high heat, whisking until the sugar is dissolved. Keep cooking on high heat until all the water evaporates, the sugar starts to caramelize, and turns amber. Add the cider and sake, and reduce the heat. Then whisk vigorously until everything is dissolved. (When you add the liquids to the caramel, it will seize up; you need to whisk until it’s redissolved. Turn off the heat, then add the shoyu and any juices that dripped off the steak. That’s it. Best damned steak ever. This entry was posted in Recipes on July 5, 2015 by markcc.